The major struggle of the Ukrainian trade unions with the global steel corporation Arcelor Mittal for a living wage and safety at work has moved to a new stage as the company has moved into the courts to try and block the workers action. In astounding decision a court in Kyiv stopped negotiations with the unions. A second hearing scheduled for 19 June was postponed. We publish below an analysis of the first court hearing from Social Movement who has been active in supporting the campaign in Kryvyi Rih. We also welcome the call by Lloyd Russel-Moyle MP for solidarity with the Ukrainian trade unions in the Early Day Motion he has submitted to Parliament – Early Day Motion 1412 . Ukraine Solidarity Campaign calls for protests at Arcellor Mittal office and workplaces in support of the workers of Kryvyi Rih. 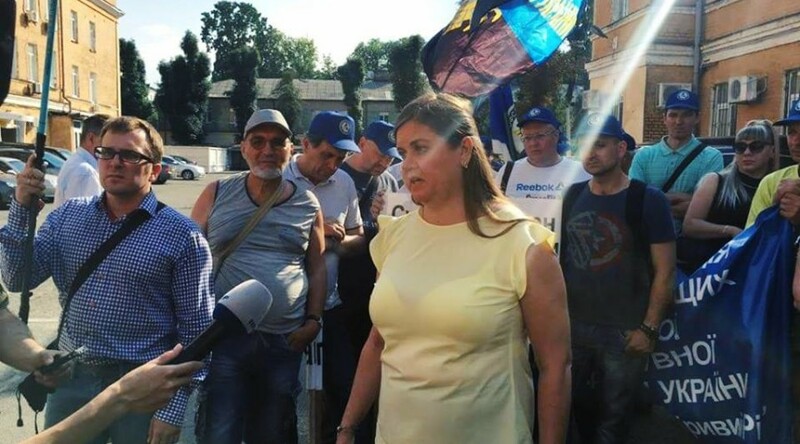 On Wednesday 30 May the representatives of the workers of “ArselorMittal Kryvyi Rih” showed up for negotiations with the administration. But they were informed by the owner’s side that the court had stopped the negotiation process on 23 May 2018. One can only imagine the astonishment of the trade unionists. In particular because it was only on that very day that proposals had been worked out, which might have satisfied both sides. The subject of the administrative dispute is the legitimacy of the conference of the workers collective on 27 March, where the demand for a wage of 1000 euros was raised. It was not possible to demonstrate that the demand was socially and economically unfounded, therefore the arguments took the form of bureaucratic formalities. It is not an accident that at the same time the International Confederation of trade unions highlighted the fact that the right to strike has been heavily restricted in Ukraine. The matter is still being investigated in the court, however on 23 May 2018 the judge of the circuit administrative court in Kyiv, Ihor Smolij, gave his approval to stop the process within the framework of protecting the court action. However, the court action by the AMKR administration had been initiated in April 2018. Throughout this time, the administration had been pretending to dialog. In May it had already agreed to use the services of the reconciliation commission, and it had seemed that the quality of the dialog was improving. Simultaneously a court procedure was being initiated behind the backs of the Krivyi Rih workers. We won’t say whether such behaviour has anything in common with the social responsibility of a corporation. However, the administration showed through their cynical acts that the “ceiling” of wage increases was 25%. The owner is afraid not only of a strike but also of any negotiations that could go against him. Thus the owner declares in advance that there will not be any salary increase. He is not prepared to discuss this in any way. It is said that the “authorization of the representative organ of the employed workers to make decisions about the entry into a collective labour dispute was not determined legitimately”. If the workers had not given their authorization to the negotiators, then why at the beginning of May were there regular reconciliation meetings? This remains unclear. To prevent the National Service of Mediation and Reconciliation, in particular the Dnipropetrovsk Oblast branch of it, and other organs or individuals to engage in negotiations, implement actions or to take decisions in the collective labour dispute, registered as the Decision of the National service of Mediation and Reconciliation No 118 of 6 April 2018 entitled “about the registration of the collective labour dispute between the employees of the public stock company “ArcelorMittal Kryvyi Rih” of Kryvyi Rih city in the Dnipropetrovsk Oblast and the public stock company “ArcelorMittal” in Kryvyi Rih. The owner has already achieved his main goal, ie the investigation into the essence of the issue will take a long time. Thus, the matter will only be investigated by the court on the substance of the issue. However, we can already arrive at sad conclusions. It is striking that the court forbid anyone from engaging in negotiations about a salary increase. Thus, the court made decisions about the rights of individuals, who were not even attached to the case. The responders are thus only the National Service of Mediation and Conciliation and its territorial organ. It is being declared, that the workers collective or the union had incurred procedural violations, but they didn’t even take part in the examination and were not able to explain anything. To accept decisions about “any” persons is not correct, indicated by higher court decisions back in 2010. One could say that the court decided the dispute in its essence, because it agreed with the argument about a hypothetical violation by the workers. In the past the Higher Administrative Court of Ukraine has stated that the taking of such important decisions before a full examination of the circumstances was illegal. Having examined the indicated grievance the court has concluded that it is well founded, arising from the fact that there exists a high likelihood of a further removal of the disputed property and which brings with it negative consequences for the plaintiff, therefore the application by the plaintiff for its protection is granted. complaint about the protection of the court action is dependent on indemnity/satisfaction/being satisfied. The dispute, it should be underlined, was not a question of property rights. What is this – did the owner really risk the immobility of his property? Would the workers have organised the plant for themselves if there had been successful negotiated results? No. Let us imagine that the phrase was taken from a different judge’s decision, which really applied to immobility. This is a clear example about the rigour of a judge in a given matter or about the quality of judges in general . The most interesting, we guess, is still to come. We declare that no decision about the protection of a court action will stop the growth of social tension and the radicalisation of the working class.